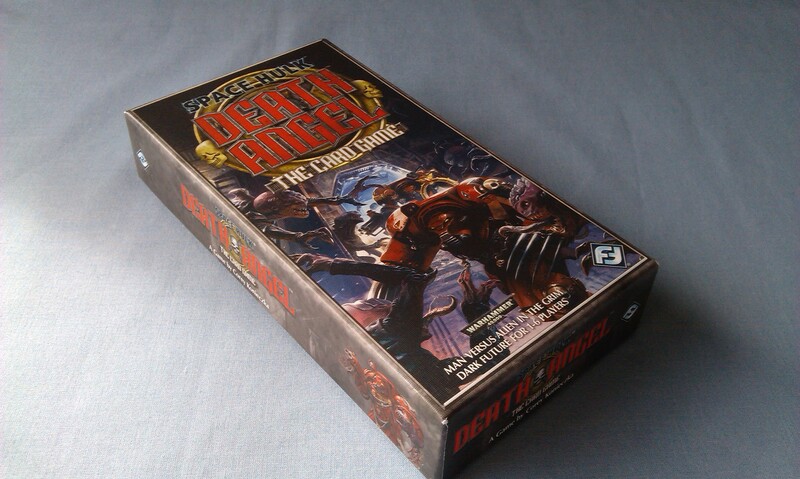 It’s game day Tuesday, and in the spirit of trying something different, today I’m doing a sort of twelve-months-on thing for a blog I wrote last September, around the very excellent Space Hulk: Death Angel from Fantasy Flight! I have no idea if this will become a regular thing, though I think it might be nice to look back on some of the games that were featured here as a first look rather than because I have a lot of experience with the game. So I’ll take a look at the initial blog, see if I’ve changed my mind on some things, and just generally waffle in my own inimitable way! You’re probably used to that, by now, anyway! 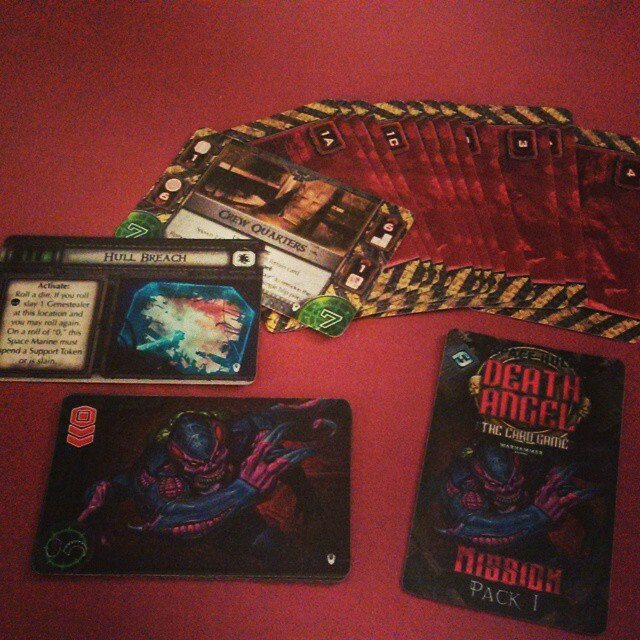 I suppose the main thing from my previous blog was that the game was super-difficult, super-thematic, and super-fun, with some print-on-demand expansions that really add to that all around. Having played a fair few games with this now, some with the expansions thrown in, I can definitely say that my initial assessment still stands! Which brings me onto something that I think is slightly unexpected – or at least, I wasn’t expecting it! More than any other game I’ve played, this one has forced me to think much more tactically about how I play. I think I’ve mentioned a few times now how I really only play games for amusement and don’t take them seriously at all – the few times I’ve played against a really tactical player I’ve ended up ruining their day by just going into the middle and blowing stuff up. I can kinda see how that could be irritating, too – maybe I should take things a little more seriously… Anyway, with this game, I’ve suddenly begun to think super tactically about how I set the formation, where the marines are facing and who can cover who, etc. It’s something that has really surprised me, as in the past I would have set this game up completely at random, thinking I’ll react to things once they’ve happened. This is definitely a new experience for me, anyway! The expansions to this game are just terrific, as well. I’ll keep the discussion focused on Mission Pack 1 and Marine Pack 1, as they’re the ones I’ve used most often, but all four have so much to commend them! Mission Pack 1, above, includes a whole new set of rooms to explore, along with an extra room and a new type of enemy, the adrenal genestealer. In the tabletop game, adrenal glands make Tyranid creatures fight into a frenzy, making them tougher to kill. Unfortunately, that doesn’t really come through in the mechanics here, where the big difference about this monster is that he has two movement icons, making them more likely to move when the event card is drawn. It’s kind of a deal, but not really. If he made two attacks, or something, then it could perhaps be more in-keeping with the fluff, but no matter. I do like the fact that, if the attack rolled a 0, the swarm will shift down and attack again, but this never came up in the games I played to really get the effect. Playing with Mission Pack 1 is the only time I have actually won this game, which is something that definitely goes in its favour! I can’t say that the new rooms add anything specifically new to the game, they’re very much in the vein of more of the same, but that doesn’t really matter as it’s different enough that it can still provide some tension if the base game is becoming stale. Space Marine Pack 1 brings two new teams to the table, and I have to say, I really like both of them! In my blog the first time around, I thought the grey team looked good, but I have to say, they’re both really great – the dark orange team proved to be particularly effective in the games I’ve played with them! In addition to the “target lock” support card that allows you to place a support token on a swarm, and use that to re-roll attack and defense rolls, the “cyclonic volley” attack card proved to be incredibly useful! 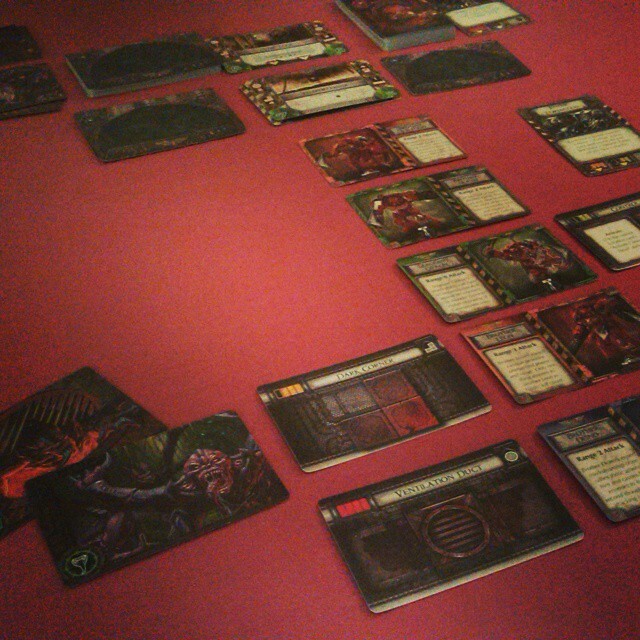 I lost track of the amount of times I wound up saying, “Brother Adron, you animal!” as he decimated through the swarms! I’ve only tried the Deathwing marines once, using half the pack essentially, and these guys look like a lot of fun. A lot of the cards seem like they should be incredibly overpowered – cards that let you attack in the support phase, cards that let you just spend support tokens to slay genestealers – but they really aren’t, which I suppose says a lot about the balancing of the game! 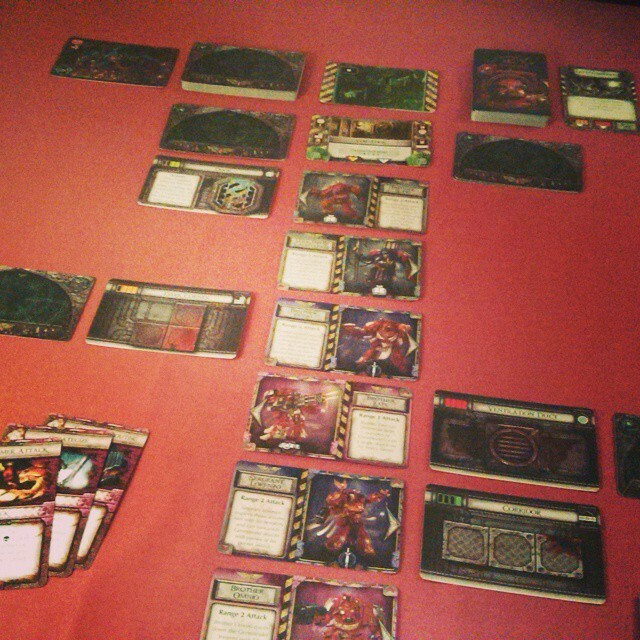 There’s a card called Secrets of the Brethren that allows a marine to spend tokens to slay genestealers, rather than roll that damn die, but whenever I’d managed to set it up so that he could do some major damage, I would always draw the event card Stalking from the Shadows prior to his attack. And because I’m an incredibly lucky person like that, he would be the only viable target to have all of his support tokens removed. So yeah. Tough. I’ve mentioned the Tyranid expansion before of course, and I can’t say my feelings there have changed, either! Very brutal, though you can get lucky and only draw generic Tyranids, which are really no different to the genestealers from the main game. I do wish there had been more alternate art used for the generic bugs, though I suppose with four other types of Tyranid creatures in the deck, overall there is enough variety. Overall, I love this game. I love how it makes me think about what I’m doing, and how difficult it can be to overcome. When you lose, it makes you want to try again, and when you win, it still makes you want to try again! Due to the amazingly modular nature of the components, it never feels like a solved game, so you keep trying no matter what. If you can get past the weird nature of the rulebook (or just check out youtube!) then you’re in for a really great experience. This is definitely a game that I am glad to have in my collection!